Few more difficult contexts exist for local economic development than the aftermath of conflict. Destruction and irreplaceable loss create conditions of fear, uncertainty and instability for people and places. As conflict situations end or begin to work towards resolution, the importance of recovering local economic development becomes pressing. Restarting economic activity and especially employment plays a critical role in contributing to stability, reintegration, livelihoods and sustainable peace. Creating jobs helps people and communities to cope and survive in the short term by addressing their basic needs. Revitalising local economic potential, reinstalling social safety nets and mending broken infrastructures become the focus of medium and longer term efforts. Getting local economies back on their feet following conflict is no easy or straightforward task. 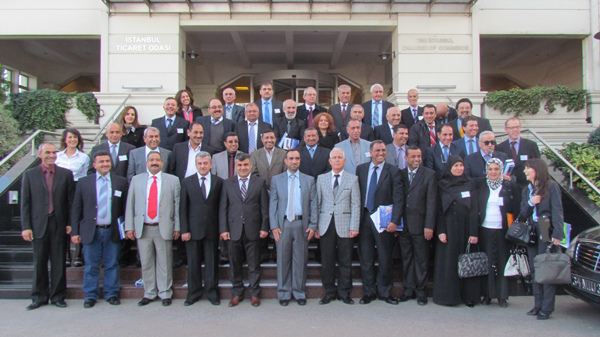 The United Nations International Labour Organisation (UN-ILO) Programme on Crisis, Response and Reconstruction has been actively involved in post-conflict states internationally. Critical has been its establishment of an integrated approach to local economic recovery and development. 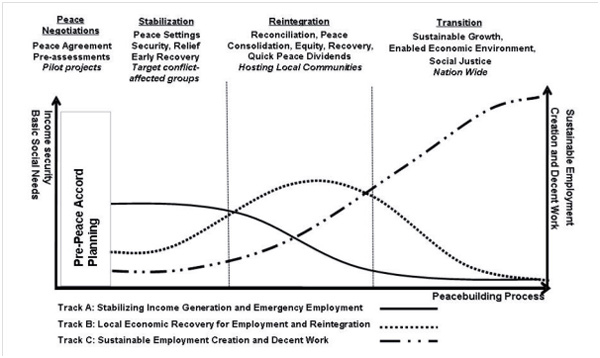 The framework uses what the ILO describe as ‘one programme on three concurrent tracks’ to work through the phases of peace negotiation, stabilization, reintegration and transition towards the ultimate aim of sustainable employment creation and the ILO’s particular vision of ‘Decent Work’ (Figure 1). Addressing the questions of ‘what kind of local economic development and for whom? – Central to the rebuilding of local economies in post-conflict situations is the need for a vision of what sort of economy local communities aspire to and desire. Prior to conflict economic structures may have been dominated by specific sectors and labour markets may not have been producing sufficient jobs. Planning in the post-conflict context offers an opportunity to think through how the local economy structures might be reshaped and modified in ways more beneficial to the particular form of development required by local communities. (Re)building capacity – Destruction of physical, social and intellectual assets during conflict creates substantive gaps in the capacity actually to undertake local economic development and its planning. Bringing together the remaining expertise and nurturing new talent become critical tasks in enabling regional administrations to follow the process. Crucially this involves learning by doing and engaging local stakeholders as part of an inclusive and participatory set of activities. Do you first need decentralized governance to generate growth? Or should growth be the first priority and then governance reform? Progressive social and economic reform – The conclusion of conflicts can create opportunities for social and economic change as part of the transition to peace. The key issue is engaging local communities to ensuring reform is progressive and inclusive, serving to address existing social and economic problems and inequalities such as gender inequality and youth unemployment. Critical is the need to avoid the kind of damaging reforms described in Naomi Klein’s ‘shock doctrine’ of wholesale marketization and the reinforcement of social and economic disparities and tensions. Sensitivity to context – In developing a general framework and set of guidelines to help local actors, there is a central need to adapt and tailor broadly based approaches to particular conditions. In the stakeholder engagement element of the planning process, for example, the key stakeholders at the regional level may differ with agriculture more important in one Province compared to another and trade unions elsewhere. In this sense, planning for local economic recovery and development in the post-conflict context is an explicitly place-based approach and benefits from adaptation to particular local circumstances.